One of the tasks of the young Samuel(2) was the collection of monies due from the customers of the Potteries. It was a cash business and the return journeys were often through lonely lanes and streets. Samuel(2) equipped himself with a "Life Preserver" and horn whistle for protection and to raise the alarm in the event of criminal attack. 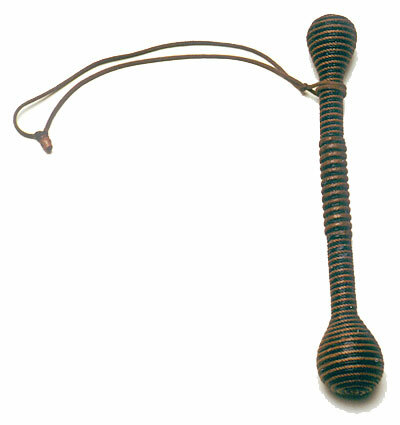 The "Life Preserver" is a formidable weapon having a flexible shaft, 8" long, possibly of whale-bone, and a lead weighted end, bound with cord. In use it was intended to be aimed at the arms or legs in order to disable the assailant. A blow to the head could easily result in fatal injuries. There is no record of the "Life Preserver" having been used in anger and it remains a serviceable weapon.